Nicolai Wadstrom, Founder and CEO of BootstrapLabs and Magnus Bergman, Venture Investment Partner at BootstrapLabs will share with Swedish entrepreneurs, local angels and the SUP46 community their journey and best tips on how to become the next unicorn! Attendees will also receive valuable insights and learn how companies like Prezi scale from a small office in Budapest to a 300+ people company in Silicon Valley. Guaranteed dose of inspiration will be provide to all the attendees! 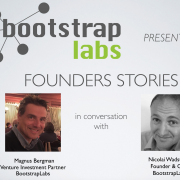 Nicolai Wadstrom, a serial entrepreneur turned parallell entrepreneur as the founder of BootstrapLabs, a Global Venture Capital firm based in Silicon Valley. Nicolai advises all portfolio startups in their day to day operations, connecting founders with industry experts, advisors and investors to increase their likelihood of success, assisting with product design and development, positioning, go-to-market strategy and implementation, partnerships and fundraising. Multiple time Startup CEO, CTO. Raised capital from Angels, Private Equity, Investment Banks and VC’s. Angel investor and adviser to Internet, Software, Mobile and Digital Media startups in Europe and Silicon Valley, including BootstrapLabs portfolio companies such as Prezi, Zerply, Audiodraft and Witsbits. Nicolai has been writing code since he was 10 years old, and still speaks Java fluently. He is very focused on product and technology development within the Big Data, Analytics, Internet, Mobile and Software/Cloud sectors. Nicolai is a frequent guest speaker, mentor and judge at Universities and Conferences in the US and Europe. Entrepreneur and investor building global mobile internet companies. Has founded and invested in several successful companies including Prezi and Truecaller. Specialised in mobile internet with a general knowledge of the special business logic of the Internet and its implications to many business verticals (e.g. telecommunications, media, financial services, retail, automotive and more). Strategic computer scientist, product developer and general manager with 20+ years of experience covering many areas of information and communication technologies. One of the pioneers in the Internet revolution, now specialised in the field of moble applications. 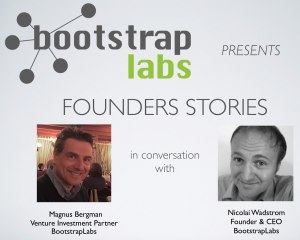 Magnus’ role as a Venture Investment Partner at BootstrapLabs is to identify and develop companies in Sweden and make them ready to move to San Francisco and BootstrapLabs with the aim to become Unicorns in the future. He is based in Stockholm at SUP46, but travels every month to SF.